Resume and LinkedIn Profile Writing: Know the Difference! Is there still a need to carry a formal resume, despite the fact that you already have a LinkedIn profile? Well, you need to realise the fact that both of them play different roles and carry individual importance, which surely doesn’t overlap. When you consider your resume, it is used or shared when you are in your active job search. On the other hand, LinkedIn is all about creating professional networks. 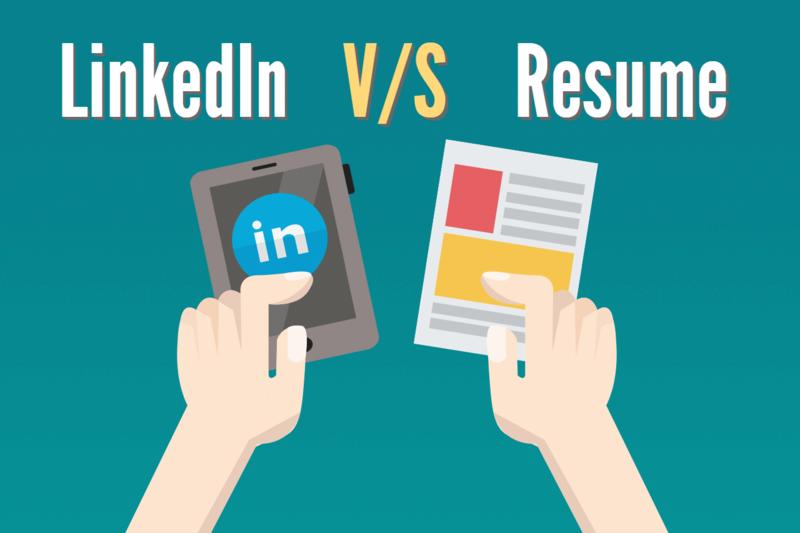 Let’s elaborate and see what resume and LinkedIn have in common! The facts of your professional and educational history shall remain the same. However, you may choose to present the facts differently at both the platforms, the gist shall remain similar. Both, the resume and the LinkedIn profile, offer you space to showcase the summary of your profile. While the resume’s summary is restricted to three-four short sentences, LinkedIn offers you the luxury of up to 2000 characters. A well-drafted resume and an impactful LinkedIn profile will have one ultimate goal, and that is to showcase your achievements and goals, collectively. However, it will be the reader’s choice as to head on to which particular platform as per the requirement of detailed information of your professional background. Multiple resumes. One LinkedIn profile. If you head on to a different industry, you might have to draft a different resume, considering the requirements and achievement s as per the industry. However, you should have only one LinkedIn profile for all your skills and areas of expertise. You need to realize the fact that having multiple profiles can lead to a lot of confusion and your dream job might slip out amid all this chaos. After all, you will need to keep a record of the invitations and connections via all the profiles and revert constantly, which can turn out to be very irking. Maintain one profile and it will have a broader reach to the audience you wish to reach out to. Resume is a very formal document you will ever write in your professional life! This is the reason why it follows a structure and why the choices of words have to be considered very seriously. LinkedIn, on the other hand, is a social network. Your tone can be comparatively relaxed and informal. The reader will usually be looking at the bullet points highlighted in your profile and hence, crafting every word isn’t necessary. Your resume, cannot b stretched and extended. It is an extremely condensed professional history of yours, well drafted on a sheet of paper. Though, LinkedIn gives you a room to post elongated and elaborated version of your resume. You get to post stories, blogs and even examples for that matter of fact! Yet, you need to consider the fact that your resume is final and static. Your LinkedIn profile is ever-evolving and it can be edited whenever you want. Traditional resumes aren’t dead. Yet, having a LinkedIn profile can grab great opportunities for you. Know the difference and draft everything accordingly!